Thankfully, history (for once), largely remembers Gough as a man to whom generations of Australians are indebted, not the ignoble governor general. This was all achieved with with a hostile senate that blocked every possible move, and the background of the 1973 oil crisis, an event that created economic havoc, just as the 2008 depression. There were mistakes of course: too little attention was paid to the economic costs of some legislation, and no doubt, Whitlam had a weak grasp of economic matters; Australia supported Indonesia’s annexation of East Timor when Portugal left. When I see what little is achieved by governments in today’s Australia, or the UK, where I have lived for 10 years, I simply shake my head. Gough went on to fight another election, which he lost, then moved to academia, became ambassador to UNESCO, joined the Australian Constitutional Commission, and in 1987, chair of the National Gallery of Australia, which just goes to show that all wise people eventually discover the same truth: that one can only make sense of later life through art. Whitlam joined three other former prime ministers in February 2008 in returning to Parliament to witness the Federal Government apology to the Aboriginal Stolen Generations by the then prime minister, Kevin Rudd [Wikipedia]. In sum: because of, and despite the errors and flaws, many of my generation and many coming after see Whitlam as a visionary, a literary intellectual, a passionate democratic socialist, and a hater of medocrity. One cannot wish for more in a political leader. Thank you Gough, I, my brothers and many of my friends owe you our university educations, some of the best years of our lives. 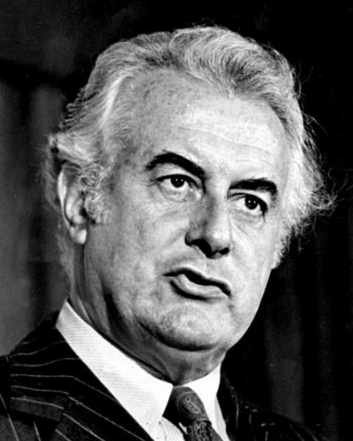 This entry was posted in Culture, Politics and tagged remembrance, whitlam by wolandscat. Bookmark the permalink.